After a fun and eventful week in Drumheller and Canmore, I was lucky enough to wrap up our holiday with a night out at the Calgary Stampede. This famous local attraction was something I hadn’t had the chance to experience before and I was really looking forward to it! I stayed at the Westin Calgary in an executive junior suite for the night. The hotel is located downtown and has valet parking. The room was very nice and large. It had two double beds and a living area with a couch, chair and desk. There was lots of room for two cribs in the room and it also had a large balcony for fresh air. The bathroom was huge and the best part (according to my 7 year old) was that you could watch TV in the bathroom mirror. We tried the room service twice and it was very fast and efficient – nice when you have tired and hungry kids (and parents), although the prices were a bit high and the kids menu didn’t feature a lot that was appealing to kids. It was full of “healthy” selections, although they did make up a plate of plain spaghetti on request and they were very accommodating. The Westin was about a 10 minute, $15 cab ride to the Stampede grounds. 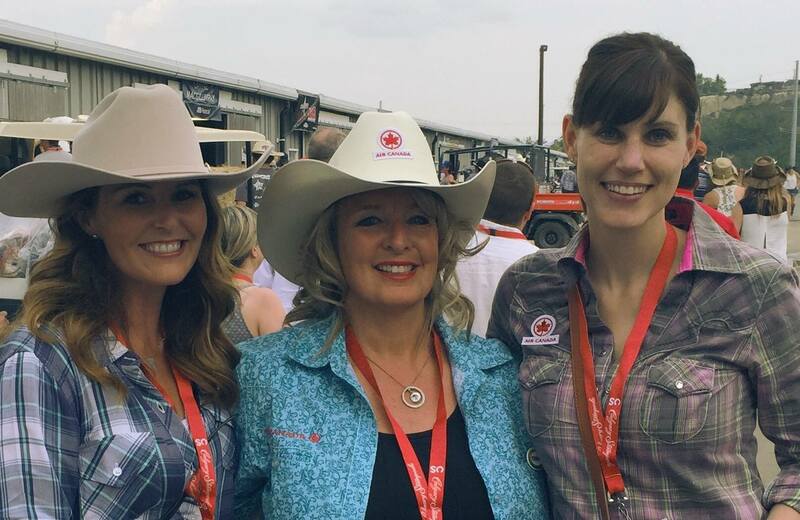 As a guest of Air Canada, I was able to explore the barn area and meet their sponsored Chuckwagon driver upon arrival. What an experience! It was great to see what goes on behind the scenes and to be able to speak with one of the Chuckwagon drivers who would be competing that evening. After spending time in the barn area, we made our way to the hosting suite that overlooked the Rodeo ring/Chuckwagon track. We were literally about 50 feet away from the action! The suites provided a server and lots of food and drink to keep everyone happy. 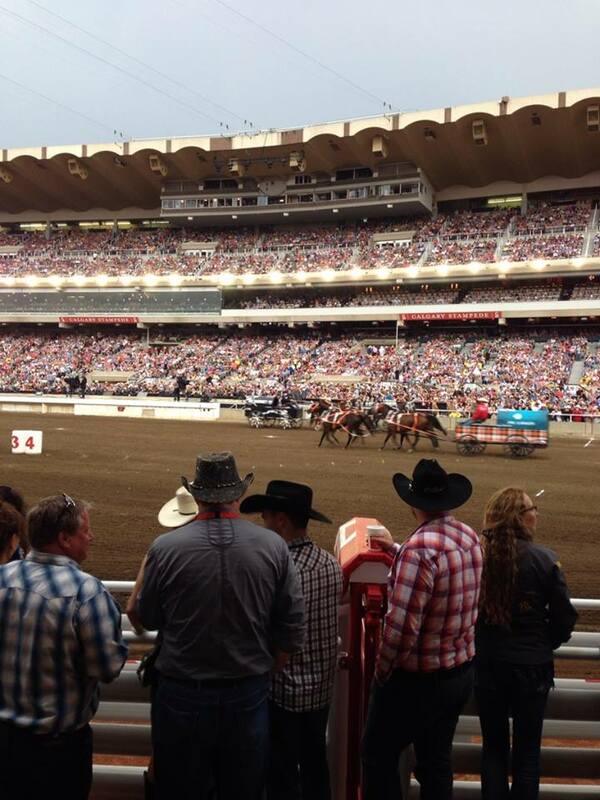 The Chuckwagon races were awesome – very exciting for someone inexperienced in the rodeo action! The Stampede, in addition to having the Rodeo events, also has a midway with all kinds of Exhibition-like rides and vendors and lots of live entertainment and music options. What a way to wrap up a holiday – an evening I won’t soon forget! Some of my best memories as a kid were of camping and skiing in the Rocky Mountains. I was excited to share this with husband and kids who had never spent any time in the area. We stayed at the Grand Rockies Resort in Canmore. The resort has great potential, but is showing some wear and tear and the rooms need a little love. That being said, it was a 2 bedroom condo that worked well for our family. I really enjoy having our own kitchen so we don’t have to eat out much – eating out with 2 babies is always an adventure! The condo had two bedrooms and two bathrooms and a balcony with a view of the Rocky Mountains. By far, the best part of the hotel is the waterpark/pool area. They have a pool with a waterslide as well as a toddler pool with a mini slide and an indoor/outdoor hot tub. The pool area was very clean and well maintained. The kids all loved it and we spent many hours here! While in Canmore, we walked to Downtown for some shopping and it has lots of gift shops and specialty shops – great for those looking for hiking and outdoor gear as well as some candy shops that were to die for (especially the Reece’s Pieces Squares – dangerous!). It was about a 15 minute walk from our hotel to downtown, which was perfect. Canmore is actually my preference to Banff now for accommodation, I think. Banff has gotten so busy and Canmore is a lot more laid back and quaint, but still surrounded by the mountains and a very pretty place to spend a few days. 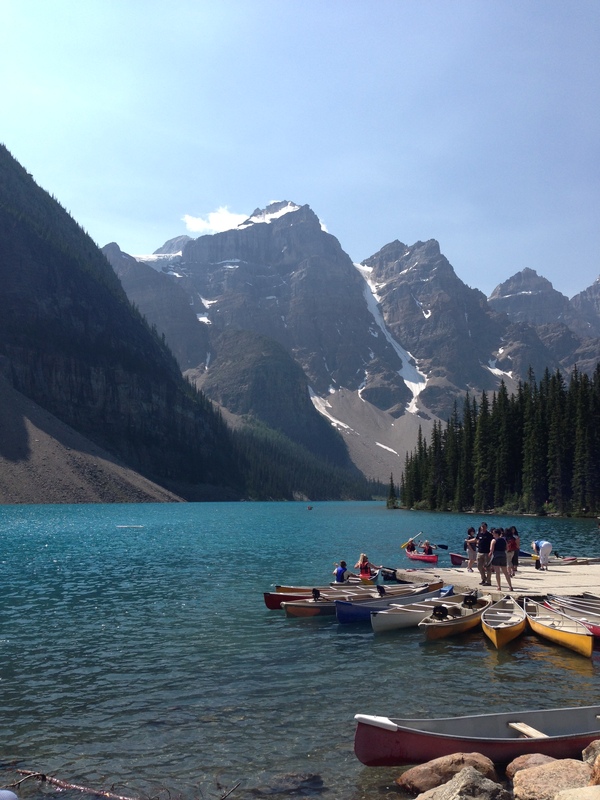 We spent a couple of days touring through the Banff National Park. 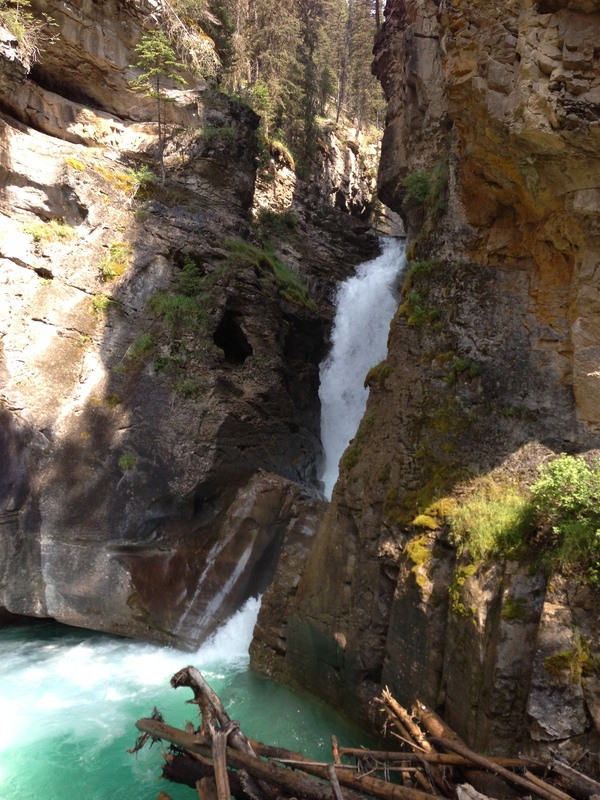 Day 1 had us enjoying the Johnston Canyon hike – the lower falls at 1.1 km each way was the perfect distance with babies in carriers! They also had the upper falls if you were feeling like a longer hike and the upper falls was a lot less busy. The trail to the lower falls was packed with people – and in fact the parking lot was full and people were parking on the highway near the entrance! I have never seen it so busy and I have been here quite a few times. After the hike, we did a driving tour past the Bow Falls and the Banff Springs hotel – both very pretty places to spend a bit of time. We parked in downtown Banff and spent a few hours wandering the shops and having lunch. Again, I was amazed at how busy it was! I think with it being Stampede week, it may have brought more people than usual to the area, but we had no problem finding parking in a parkade a block off the main street and the best part – FREE parking! 🙂 A nice surprise. Day two say us heading to Morraine Lake for a picnic lunch. I had been to a wedding at Morraine lake about 10 years ago and always remembered it as one of the prettiest places I had been. You turn off at Lake Louise and it’s another 15 minutes or so. The lake is only open in the summer and this road is closed in the winter. We arrived around 11:30 am and again, there were cars parked for almost a km up the highway. We didn’t have high hopes for a parking spot, but we lucked out and found one in the main parking area, so we didn’t have to trek in from the highway. The weather was perfect, bright and sunny and we spent a couple of hours walking around the lake and having lunch. It is about an hour and a half drive from Canmore and totally worth it! Lake Louise is right there and if you didn’t have babies needing a nap, you could easily fit Lake Louise and the Lake Louise Gondola (about $30/person) into your day. The Gondola goes over top of a natural Bear Corridor with good odds of seeing bears along the way and there is an interpretive center and restaurant at the top. I’m told this is well worth doing, if you have the time! When we were planning our summer holiday this year, it posed a bit more of a challenge than past years as we now had three children to consider, instead of only one. We needed something that was family friendly and would accommodate 2 eight month old babies and a 7 year old. We decided on a driving holiday, instead of flying and as I hadn’t been to Southern Alberta in many, many years, we decided that was a good place to start. It is an easy drive from Saskatoon and there is lots to offer in the way of family friendly activities. 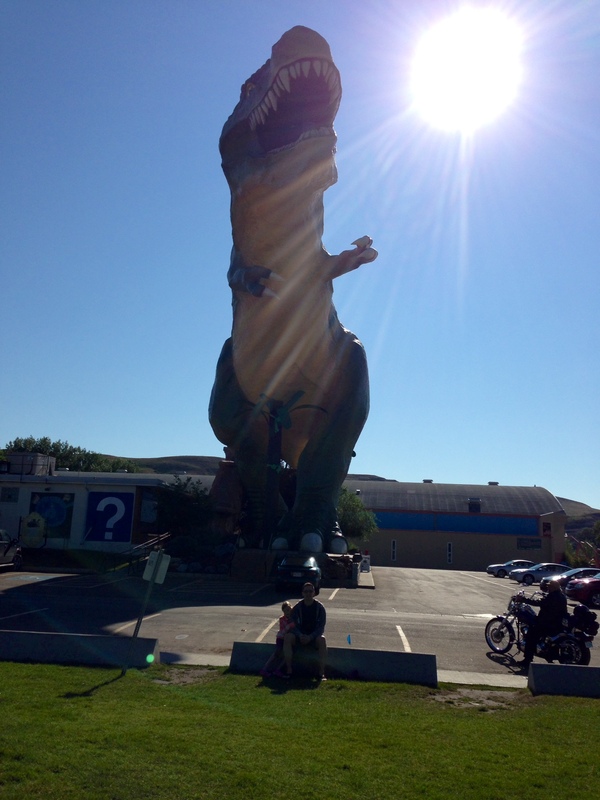 We started off our trip in Drumheller. We stayed at the Ramada Drumheller, on the recommendation of my sister and found it was a good family hotel. It is a relatively new hotel – a couple of years old. They have one bedroom suites that have a pullout couch, king bed, microwave, fridge, coffee maker and lots of room for 2 playpens. Dining was easy as the hotel included breakfast and it also has a McDonalds and a Boston Pizza in the parking lot. The Ramada has a nice pool area with a waterslide and a hot tub. Overall, I would recommend it and would stay there again. Our activities in Drumheller were limited to a drive around town and a stop at the Royal Tyrell Museum as we wanted to drive to Canmore that same afternoon. The cost of entry is about $14.00 for adults and about $7.00 for kids 7 and up. Kids under 7 are free. The museum is very well done and interactive – you can see scientists working on current finds and the array of fossils and displays is amazing – definitely world class! They offer short programs – digs and walks for kids and families, but we didn’t have time to participate. Next time, we agreed we would spend more time in Drumheller as we would like to experience the HooDoo walk and some of the other attractions in town. It had more to offer than I remembered!